A few kids growing up in New Jersey start a band. A trio. One of those kids, Frankie Valli (John Lloyd Young) had a great and unique voice. But trios were passe and they needed to add a fourth voice and someone who could write. As luck may have it, their friend (who happens to be Joe Pesci) introduced them to someone who could both sing and write. But life was still not easy….the band, going by several different names, had a hard time breaking into the music business. They landed a backup job for a year, but, need something more: A consistent name, unique sound, and a breakout song. One day, at the depths of despair after being turned down for a gig at a the bowling alley, they finally hit upon a name for the band (it was a sign, literally): the 4 Seasons. The writer, Bob Gaudio (Erich Bergen), was inspired and wrote a song that changed the world: “Sherry”. The rest….as the saying goes…..is history and the music world was never the same. Frankie Valli and the 4 Seasons became sensations. But all was not easy, as their personal lives interfered with the band. “Jersey Boys” is a terrific movie melding the personal stories with the eventual success of the 4 Seasons. For me, it was a trip back in time and I loved the songs and the story. The movie absolutely sparkled when they played the music. 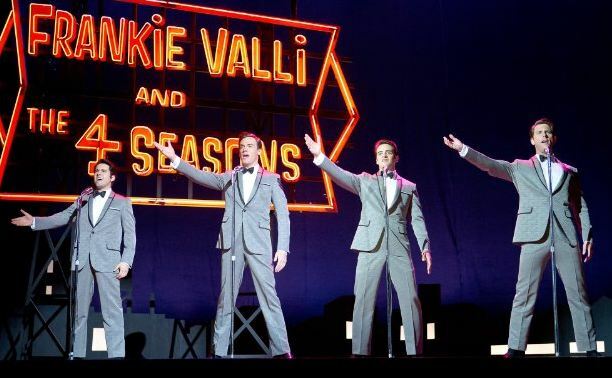 Watching “Jersey Boys” I also appreciate the fact that if you are from New York (I grew up on Long Island) or New Jersey….and make a friend….that friendship lasts forever, no matter what happens. In California, unfortunately, friendships come and go with the wind. Go to IMDb for more information. We watched this on “free” Xfinity.